Home // Articles // How Much Will a Wood Privacy Fence Cost? How Much Will a Wood Privacy Fence Cost? 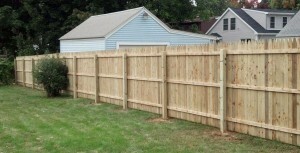 A wood fence installation is a great way to increase the amount of privacy around your home. It is not only practical but also adds curb appeal. There are homeowners who do their own installations. For others, they prefer hiring a licensed contractor for the job. Regardless of which route you choose, you will want to know the out-of-pocket expenses. Fortunately, there is an easy way to calculate the cost. Pricing involves knowing the cost per panel and measuring the perimeters of your property. A fence consists of multiple panels. Multiply the price for each panel times the number required for the project gives you rough estimate. This is a general rule of thumb to follow, especially if you are getting replacement. If this is your first fence installation, taking precise measurements is important. Measure the area you are enclosing at least two times before starting construction. Getting the calculation correct will ensure you obtain the right amount of lumber for project. There are unique conditions that can impact the cost. For example, tough terrain or gates can drive costs up a bit. Take note of any property features that could affect the way your wood privacy fence will be installed. Wood comes in different grades, types, features and price points. You have a variety of options ranging from rails and posts to fasteners and pickets. Choose high quality materials that fit within your budget and your home’s architectural style. These tips give you an idea of how to estimate the cost of a fence installation. If you don’t want take this on as DIY project, then it is best to hire a licensed contractor to do the hard work for you. Although labor costs will be included, hiring a professional ensures the job will be done right. In addition, it will save you tons of time, energy and stress.